The Ascot Summerhouse is a charming garden building with small roof overhang and profiled fascia boards. The fully length plain glass double doors are fitted with antique hinges as well as an ornate handle and lever lock. To the front and side, the Ascot benefits from four fixed plain full length windows, allowing vast amounts of natural light inside. This Summerhouse comes as standard without a veranda however, there are two veranda sizes available; 2'6" (76cm) and 4' (122cm). There are also many other options available such as 15mm (0.6") log lap cladding, 18mm (0.7") premier shiplap cladding, opening windows, toughened glass, heavy duty framing and various felt options. All buildings are pre-treated with a quality water based preservative. It is recommended that a top coat is applied on installation for longevity. With a light internal space, the Ascot Summerhouse 10'x10' (1.52x3.05m). Featuring fully glazed plain double doors and four fixed windows. With a light internal space, the Ascot Summerhouse 10'x12' (1.52x3.66m). Featuring fully glazed plain double doors and four fixed windows. Ascot Summerhouse 10'x8' (3.05x2.44m) with full length plain double doors and four fixed windows for a light internal space. 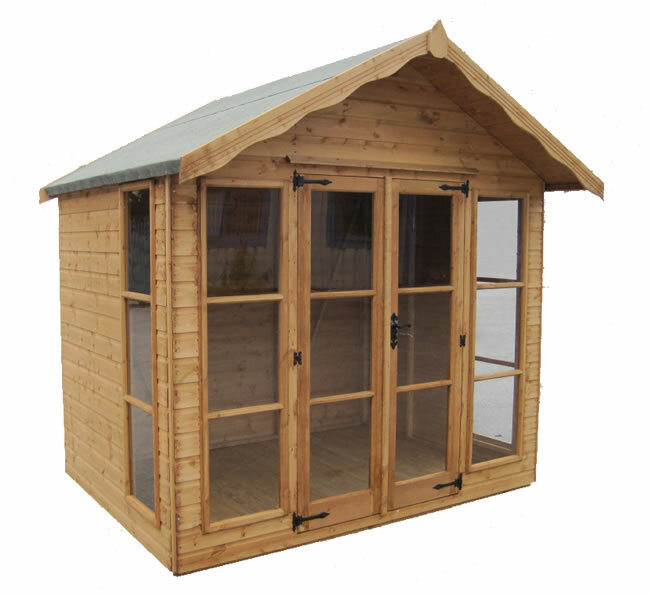 With fully glazed plain double doors and four fixed windows, the charming Ascot Summerhouse 12'x10' (3.66x3.05m). The Ascot Summerhouse 12'x12' (3.66x3.66m). Featuring fully glazed plain double doors and four fixed windows for a light internal space. With full length plain double doors and four fixed windows plenty of natural light, the Ascot Summerhouse 12'x8' (3.66x2.44m). Featuring fully glazed plain double doors and four fixed windows, the charming Ascot Summerhouse 14'x10' (4.27x3.05m). Ascot Summerhouse 14'x12' (4.27x3.66m) with full length plain double doors and four fixed windows for a light internal space. Ascot Summerhouse 14'x8' (4.27x2.44m) with full length plain double doors and four fixed windows for a light internal space. The Ascot Summerhouse 5'x10' (1.52x3.05m) with full length plain double doors and four fixed windows. The Ascot Summerhouse 5'x12' (1.52x3.66m) with full length plain double doors and four fixed windows. Ascot Summerhouse 5'x8' (1.52x2.44m) with full length plain double doors and four fixed windows for a light internal space. Ascot Summerhouse 6'x10' (1.83x3.05m) with full length plain double doors and four fixed windows for a light internal space. The Ascot Summerhouse measuring 6'x12' (1.83x3.66m). Perfect garden retreat with full length doors for plenty of natural light. Ascot Summerhouse 6'x8' (1.83x2.44m) with full length plain double doors and four fixed windows for a light internal space. A light and bright summerhouse, the Ascot 8'x10' (2.44x3.05m). Featuring full length plain double doors and four fixed windows. Ascot Summerhouse 8'x12' (2.44x3.66m) with full length plain double doors and four fixed windows for a light internal space. Ascot Summerhouse 8'x8' (2.44x2.44m) with full length plain double doors and four fixed windows for a light internal space.